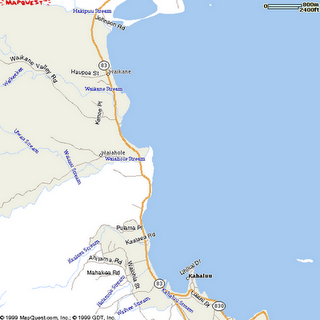 Husband and I were driving south along Kamehameha Highway, at a comfortable cruising speed of 38mph. At the Waikane Valley Road bus stop, there were several men dressed in camouflage fatigues, rifles in ready position, posted on the side of the road. One man paced the expanse of the highway with his rifle in the ready position while three others stood with rifles drawn. There was a large camouflaged truck that, according to my husband, appeared to be a Marine Truck. Fear instantly gripped my heart, as I ran down a few worst-case scenarios regarding martial law and the need for the U.S. Federal Government/ Military to take over the State highway. Waiahole, a rural area of O'ahu, is far from an urban war zone, is not a disaster area, and is not currently being threatened by foreign powers... unless, of course, Water-Rights Activists are the new terrorists. In which case, there are many in Waiahole. And if they are the new terrorist, when does the average citizen with an opinion that is anti-big-federal-government (such as myself), become a terrorist? In my utter disgust in what I witnessed, armed military men, I immediately called 911 to report what I witnessed. "911. Police, Ambulance, or Fire?" the operator spoke. "Your call is very important. You will be routed to the next available operator." and on and on, the recording played. "Emergency. How can I help you?" said the operator. "Yes. I'm driving through Waiahole. Directly across the poi factory, there are men with guns, dressed in camouflage." "Guns? Hand guns or rifles?" "Rifles. There are several of them with their weapons brandished. One man is pacing back and forth. The others are standing with their weapons." "Is it SWAT?" the operator responds. "No. They're dressed in camouflage." "Do they look like Army men?" the operator asks. "I will forward this information to my supervisor and we will check into it. Thank you for calling," then she hangs up. The government derives its powers from the governed. We, the people, are a mightier force than the government if we are united in the same cause of preserving liberty. Each of us have the responsibility of becoming fully educated on what we are entitled to. Yet, Americans have fallen into a "comfortable complacency" which is a nicer way of saying IGNORANT! United, with a common goal, we are far greater than those that rule us. Yes, the Hip Hop generation is powerful. Tupac fans were united in our admiration for the late, great rapper and his influential, lyrical wisdom. So powerful was Tupac's message that before being ousted from her seat in the House of Representatives, Cynthia McKinney began crafting a bill for the government to release the files on Tupac Shakur. This is the same Cynthia McKinney that was the Green party nominee for President of the United States. The government recognized Tupac's ability to move the crowd and that is a threat to the powers that be. On the flip, it is evident that the power of the people could overcome tyranny. All we need is a unifier. Tupac was THAT! After I witnessed the "martial-law-like" incident, I continued on into downtown to handle some personal business. On the streets, as we walked the pavement, husband and I ran into a young man with a shirt that read: HAWAIIAN INSURGENT. I wish I took a picture of it. I should have turned back and chased him down. I feel the message he announced on his shirt. The occupation of Hawai'i, as well as the occupation of Iraq have similarities. The casualty of war=the host culture of the land. That is altogether a blog for another day. However, I see a generation of young people wanting the injustices to stop. Whether it's the hip hop heads or young Hawaiians, we are totally empowered to bring about change in a morally decaying world. We are endowed by our Creator, our God, to preserve and pursue liberty at all costs.